New Delhi, July 19 (IANS) Describing China as a “bigger threat to India than Pakistan”, Samajwadi Party leader Mulayam Singh Yadav on Wednesday sought the government’s response on the military stand-off at Doklam. Speaking in the Lok Sabha, the former Defence Minister also accused China of conspiring against India and urged the government to openly support the independence of Tibet and ban Chinese products in the country. “China is a bigger threat to India than Pakistan. Pakistan cannot do anything to India. I have been saying this since the last 20 years. Now, it’s clear that China is conspiring against us. In Kashmir, China is supporting Pakistan even with arms and ammunition. This should be strongly protested,” Mulayam Yadav said during Zero Hour. 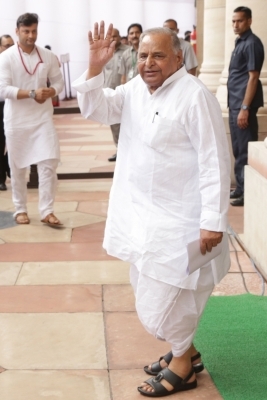 Mulayam Yadav’s remarks came after the opposition parties staged a walk out of the Lok Sabha demanding immediate discussion on the issue of farmers’ plight. The SP leader said that the Chinese army and their weapons have been seen in Kashmir. China is even constructing a road in Pakistan-administered Kashmir. “We should diplomatically protest it. Pakistan with China has adopted a strategy to infiltrate Kashmir, which is very dangerous,” he said. Yadav said that India has accepted China’s authority on Tibet, which was a “blunder”. “Now, India should openly support Tibet for its independence. India should also help Tibetan religious leader the Dalai Lama as much as it can. This will be a befitting reply to China,” he said. The veteran leader also demanded a “ban on Chinese products in India in the nation’s interest”. “If China continues to help Pakistan and interferes in Kashmir, India should ban Chinese products. If need be, we should have a rethink on diplomatic relations,” Yadav said. He also demanded a complete review of India’s relations with China. The stand-off between the armies of India and China in the Doklam plateau in the Sikkim sector has led to strain in diplomatic ties, with the Chinese state-run media openly talking of war. The government last week briefed the leaders of political parties and assured them that the issue will be resolved diplomatically.